This week began the shift in Beit Shorashim from Purim to פסח (Pesach-Passover). 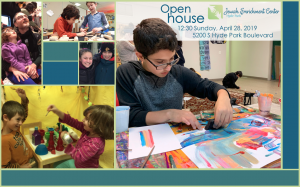 Our environment has up new pictures, and we have lots of different new games and explorations out to get inside of this holiday. Our big focus for nursery children is learning what a Seder is and knowing some of the different items on the Seder plate. 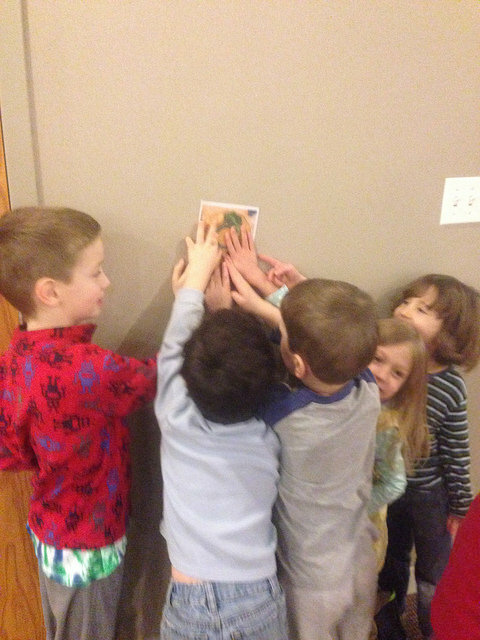 The מטבח (mitbach-kitchen) has been a favorite among children and they were so excited to see matzah, a seder plate, and a הגדה (Haggadah) and spent a lot of the days setting the table together for a big פסח (Pesach-Passover) Seder. 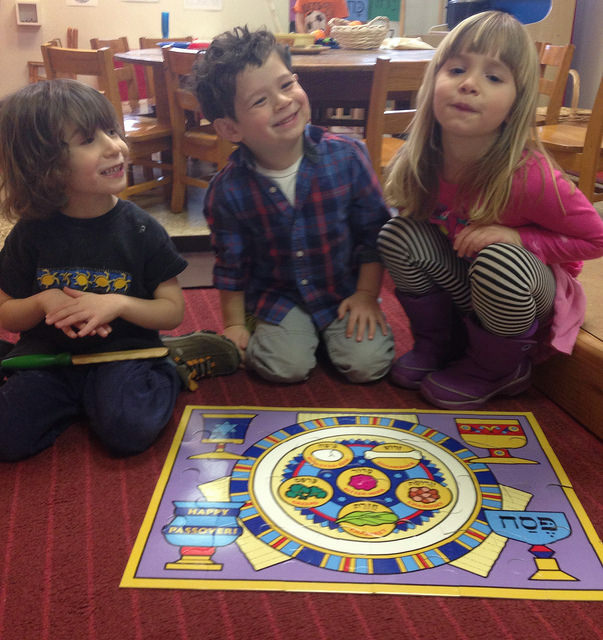 We have also had lots of play with פסח (Pesach-Passover) memory games, go fish, and puzzles in the shape of a Seder plate. To learn even more about what happens during this holiday, all of our games over the next few weeks will involve something from the holiday. 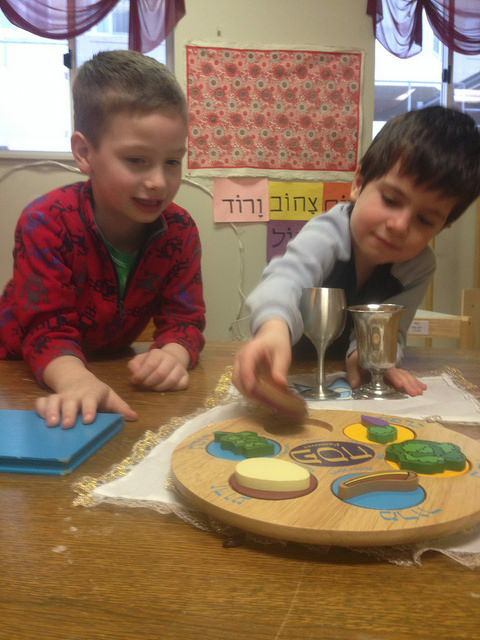 This week we did a relay with the four cups of wine or grape juice, did yoga, and played freeze tag like Seder plate items, and pointed to different Seder plate items around the room. A four year old and a five year old set the table for a Passover Seder. Pointing to the items on the Seder plate during משחקים (Mischakim-games). Shorashimers will also be creating their own Seder plate and place mat in יצירה (Yetzirah-art/creativity) to take home with them and use at their own Seders when פסח (Pesach-Passover) comes around. A five year old colors in his placement that will go under his Seder plate. 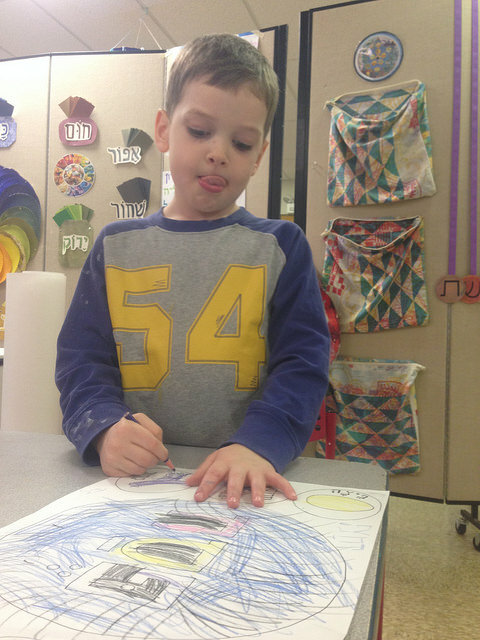 Another favorite for a few children this week has been learning the מה נשתנה (Ma Nishtana-four questions) in Hebrew. We have iPads set up in our Sifria with a recording of מה נשתנה (Ma Nishtana-four questions) that children can listen to and try and learn themselves. I think we may even have a few nursery children who will learn it in time for their own Seders! 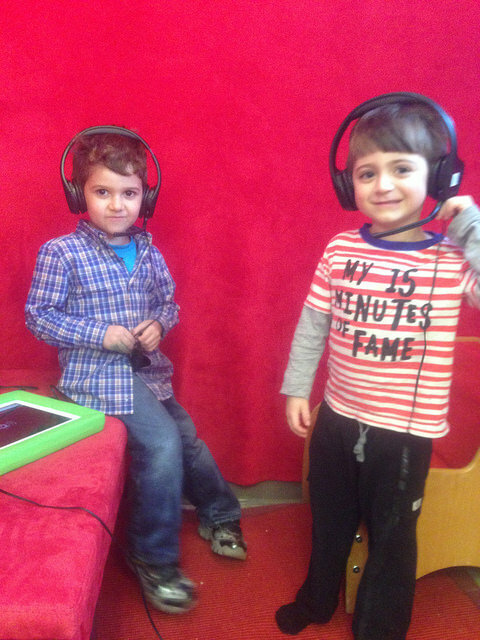 Two three year olds listen to and try and learn the מה נשתנה (Ma Nishtana-four questions).